Growing up, we had a pond in our backyard that would freeze every winter and I would invite all my friends over for pond hockey. I had a group of about 8 or so close friends and I was the only one who did not play for the varsity hockey team (I happened to be a proud member of the basketball team instead). Needless to say, for me, pond hockey was never about being good but rather all about being outside and enjoying the winter elements with a group of buddies. One of my favorite parts about playing pond hockey were the snowbanks that served as our out of bounds markers/boards. Since I was not what you would call a “strong skater”, the snowbanks became my only means of stopping. I can remember spending more time on my backside in a snowbank than actually skating on the pond. Nevertheless, I have incredibly fond memories of playing pond hockey which is one of the reasons why I enjoy watching outdoor hockey games today. 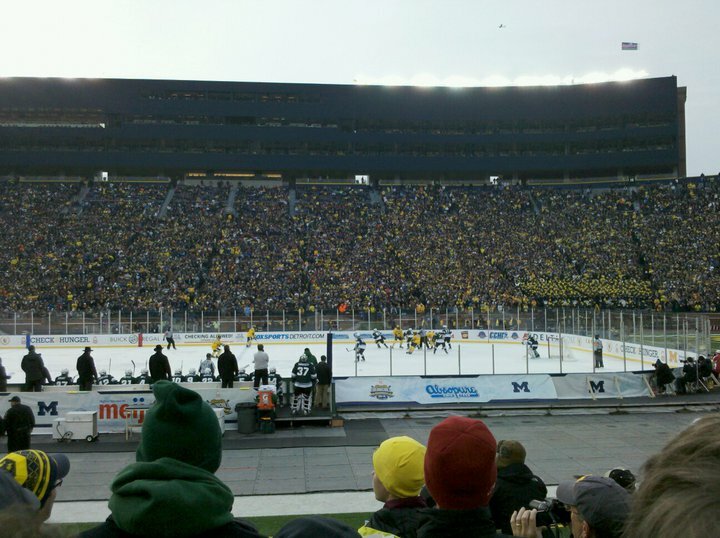 Yesterday, a record 113,411 people packed into Michigan Stadium to watch the Wolverines take on their cross state rivals Michigan State in a hockey game dubbed “The Big Chill in the Big House”. 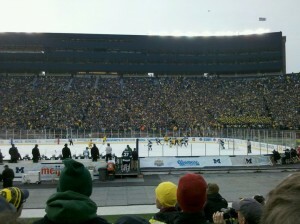 This was the largest crowd to ever watch an outdoor hockey game. It was also the largest crowd to see any event in Michigan Stadium, including football. Outdoor hockey has a ton of momentum right now. HBO is about to air the “24/7: Road to the Winter Classic” which will preview the New Year’s Day NHL game outside in Heinz Field between the Pittsburgh Penguins and the Washington Capitals. The Winter Classic has become must watch TV and a very nice lead into the Rose Bowl later that afternoon. The question that should be asked is why wouldn’t the NHL and NCAA schedule more games outside? Thanks to my friend @dgstern6 for the view. As a “Michigan Man” he would have loved to watch the game but unfortunately he was busy changing a flat tire in New Jersey. Jersey City is a long way from Ann Arbor buddy!! !